The Château is an authentic 18th century residence offering an exceptional experience. Close to Bayeux and Caen, near Normandy's historic sites (D-Day beaches, Bayeux Cathedral, Caen Memorial, Mont Saint Michel, numerous military cemeteries, Bayeux museums ...). This residence corresponds to couples seeking quiet in a charming setting full of history and families with children, thanks to the park of more than two hectares and to the beaches located nearby. The castle can accommodate 8 people (and even 10 by adding an extra bed in two rooms). 4 bedrooms each with a bathroom, two large living rooms, a small living room, a large dining room and a fully equipped kitchen will be at your disposal. You will also be able to benefit from a splendid park sported in the English of more than 2 hectares, where are arranged de loungers and lounges of garden where you can rest on the return of your excursions. This residence is located 8 kms from Bayeux (where there is a station very well served), 15 kms from the landing beaches and 30 kms from Caen. Paris is 2h30 by car. Pictures of rooms, lounges and dining room on request. Our stay at the Chateau was a fairytale backdrop to a simply wonderful and unforgettable family holiday! It perfectly allowed for the discovery of Bayeaux, although it was much dreamier to stay in -except for the daily run to the Boulanger 5 mins away. The house, garden and formal salons were so exquisite that at times we had to pinch ourselves to assure ourselves it was real -because it seemed to be like visiting those stately homes or museums that usually have a rope against a doorway allowing you only to peer in! At every turn of the Chateau and in every corner there was a delight of aesthetic beauty to discover -a true epicurean feast for the eyes, but it all was grounded with a warmth and liveability which was made possible by the excessively charming host and his excessively lovely wife. They took great care in settling us in and giving us some insider tips, all of which were brilliant, like going to the local auction (amazing) . Like other large formal homes we have stayed in the UK there were for us the usual charming eccentricities, which is very standard in a residence on this scale, like the odd bathroom that is awaiting updating. We would recommend it entirely, especially those with a sensitive spot for beauty, historic patina and a dislike of vulgar and overdone hotels with too much chrome. Our visit was entirely made by how much fun we had in this home. On a practical level, there was hardly any need for champagne because it was so ecstatically beautiful, the kitchen was modern and had every convenience to cook a large roast dinner easily. Our hosts also responded instantly to any queries we had. In conclusion, we found the Chateau lifestyle very seductive so our family fully plan on a return visit as soon as possible. Thank you to our Hosts! From "hello" the warmth of Frederique and Nicholas' Chateau Goville envelopes you. The home, and it feels like your home, has distinctive and well appointed rooms that take you back to a elegant period of French refinement. Classic bathrooms with shower tubs make this very French. The mosaic of light-switches and lighting all around reminds you of how complicated retrofitting an ancient Chateau can be over the years! A complete kitchen with formal dining room make self prep of any meal a pleasure and groceries are 5 mins away. 3 restaurants in Molay Littry are a nice break from big city stuffiness and prices. The best feature in summer is the beautiful terrace surrounded by a mature forest of arboretum worthy trees, that keep things completely quiet at night. The chateau is convenient to Mont St Michel and all D Day sites. If you wish a step back in time, this is a comfortable and warm experience. If you think you need every Ritz Carlton updated comfort and service, then leave this home to those that relish the charm of French culture and refinement from another age. 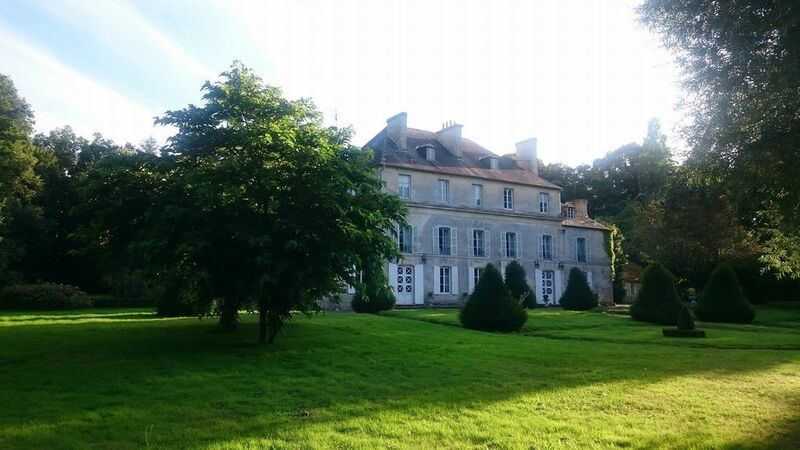 This is now our "go to" place to stay in Normandy! This property was perfect for our two families that included teenage and adult children. There was plenty of space for us to get together as a group, as well as separate to different activities. It was very convenient to the town of Le Molay-Littry which had everything we needed (groceries, gas, market) and an easy drive to Bayeux and the A13 for more touring activity. Our host was incredibly gracious and thoughtful about providing amenities including badminton and ping pong. The house itself is an incredible piece of art and history. We would definitely recommend staying here. Accueil très sympathique des propriétaires. Calme et confort total à la fois des chambres et des nombreux et vastes espaces à vivre. Agrément d'une maison de "charme" avec son parc on ne peut plus accueillant.